Armed groups in the Central African Republic have killed hundreds of civilians in an unfettered spree of bloodletting, Human Rights Watch (HRW) said on Wednesday. 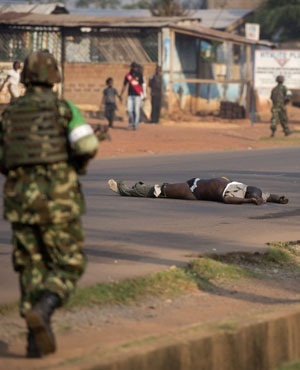 Hundreds of civilians have fallen victims of war crimes in the Central African Republic. Human Rights Watch (HRW) on Wednesday issued a 92-page report ahead of the impending opening of a Special Criminal Court, a new judicial body that will probe rights violations in the country since 2003. Investigators found evidence of more than 560 civilian deaths and the destruction of more than 4 200 homes by militias since late 2014, HRW said. But this was likely to be just a small fraction of the total crimes that had been committed, it cautioned. The killings had occurred "with wholesale impunity", the watchdog said. "Over the past two years, hundreds of witnesses told us of brazen war crimes committed by Seleka and anti-balaka fighters across the centre and eastern part of the Central African Republic," HRW researcher Lewis Mudge said. "The lack of justice for these crimes has left fighters free to terrorise civilians at will, and fuelled ongoing revenge attacks."